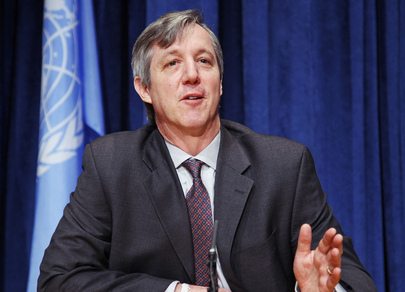 UNITED NATIONS, April 23 -- As the UN prepared to serve up on Monday its benign version of the murder of its staff member Louis Maxwell by Afghan National forces last October, Mr. Maxwell's death was raised Friday at the U.S. State Department briefing. The Department's spokesman Assistant Secretary Philip J. Crowley replied that "there’s an investigation that is still ongoing by the United Nations and the FBI, that the investigation is not completed, so I would defer judgment until the investigation is done." While perhaps only another mirage, to some the outstanding FBI investigation represents a final chance for review that is not clouded by the UN's own conflicts of interest in the matter. Since arguing with Hamid Karzai right at the time of Maxwell's death about electoral fraud, the UN has tried to get closer to Karzai, most recently accepting his de-internationalizing of an electoral review body. 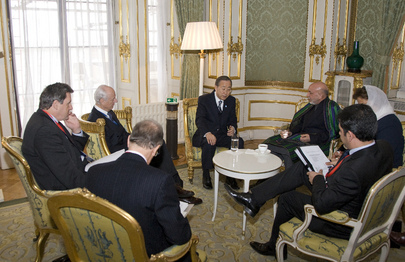 The U.S. government, of course, is also trying to stay close to Karzai even as he insults them. But since at least portions of FBI reports can legally become public, there is more accountability than in the UN system, in which reports by these in-house Boards of Inquiry are withheld in full. At the UN on Friday, Inner City Press asked spokesman Martin Nesirky who made the decision not to release any portion of the Maxwell report. Nesirky pointed back to a previous answer, that witnesses must be protected. But, for example, the UN panel headed by Heraldo Munoz which released a report on April 15 on the murder of Benazir Bhutto released its report in full. Inner City Press also asked, in light of yet another pre-release interview by the UN's Tony Banbury, whether his word "murder" is now the UN's view of what happened to Maxwell. When Inner City Press used the legal term earlier this week, Nesirky admonished to "watch what you say." Nesirky declined to answer, saying all questions would have to wait for Monday. Video here, from Minute 5:35. The one question he would have answered, he didn't. Inner City Press asked about a General Assembly report, quantifying 150 Board of Inquiry reports in 2007, and 160 in 2008. In Inner City Press' experience, very few of these are even disclosed publicly, that a review took place. So that might have been the fate of this one, except for the questions asked. 1. Can you confirm and does the UN stand by Mr. Banbury's quotes to [MS]NBC News that Louis Maxwell was "quote" murdered? If you cannot confirm this, what is your justification? 2. Did your office arrange or was your office aware of Mr Banbury's availability to NBC News? Did the EOSG arrange or was the EOSG aware of Mr Banbury's availability to NBC News? 3. Can you confirm and does the UN stand by Mr. Banbury's quotes that Andrew Hughes is the head of the probe? If you cannot confirm this, what is your justification? 3a. what day did Mr. Hughes cease his UN position? Thereafter, was he compensated or reimbursed in any way for his work on the Board of Inquiry? 3b. Who were the other members of the board of inquiry? 4. I'm going to ask again, because you have refused to address the factual question: does the UN have in its possession the UN-issued weapon that Louis Maxwell was issued? 5. Whose decision was it that the full text of this report will not be released? 6. Will the report be made available to member states upon request, or will it be withheld from Member States (besides Afghanistan) ? And what about the other outstanding questions, including to USG Malcorra? Question: in October last year, a U.S. national working as a UN security guard was killed in Kabul during a Taliban attack on the UN building. And then soon thereafter, the U.S. 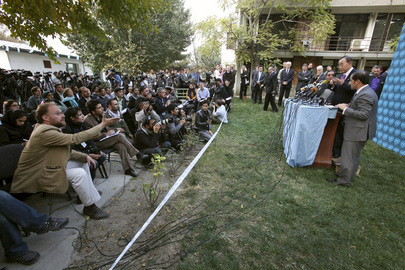 Ambassador to the UN Susan Rice said that the U.S. national was killed by the Taliban. But now there’s a UN report coming out with the – saying same that it was basically Afghan armed forces which killed the U.S. national. So what’s the factual position?